Applications are currently invited for Aboriginal, Culturally and Linguistically Diverse (CALD) or youth membership of the NSW Carers Advisory Council. There are up to three vacancies for Aboriginal, CALD or young people who have personal experience as a carer, or who can demonstrate relevant professional, academic or community experience in issues affecting these groups of carers in NSW and passion for advancing the interests of carers. The NSW Carers Advisory Council (the Council) was established under the NSW Carers (Recognition) Act 2010 to advance the interests of carers. The Council provides advice to the NSW Government on legislation, policy and other matters relating to carers. The Council meets approximately four (4) times a year in Sydney. 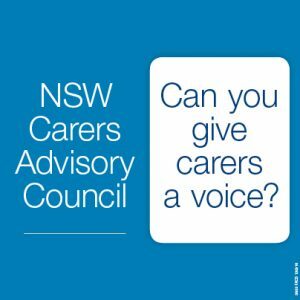 While the majority of members of the NSW Carers Advisory Council are carers, others with relevant expertise about caring are encouraged to apply. Please quote in application: NSW Carers Advisory Council Member via Pro Bono Australia.